In celebration of National FFA Week, CornerPost wanted to give our own ode to FFA. We believe firmly in what the National FFA Organization provides for its members. The future of agriculture is important to all of us, and there is no other organization that generates agricultural leadership and fosters future agricultural careers like FFA. We also want to dedicate this post to the Iowa FFA Foundation who recently held its Inaugural Black Ties, Blue Jackets Gala. We were thankful to have the chance to share in the excitement of the Gala and provide the branding and designs of the logo, invitations, packets, banners and more for the event. Thank you, Iowa FFA Foundation, for the work you do to keep opportunities available to Iowa FFA members. The blue corduroy jackets of the National FFA Organization have been a staple since 1933. To others unfamiliar with the organization, these thick, dark blue jackets may seem outdated, unfashionable or even silly. 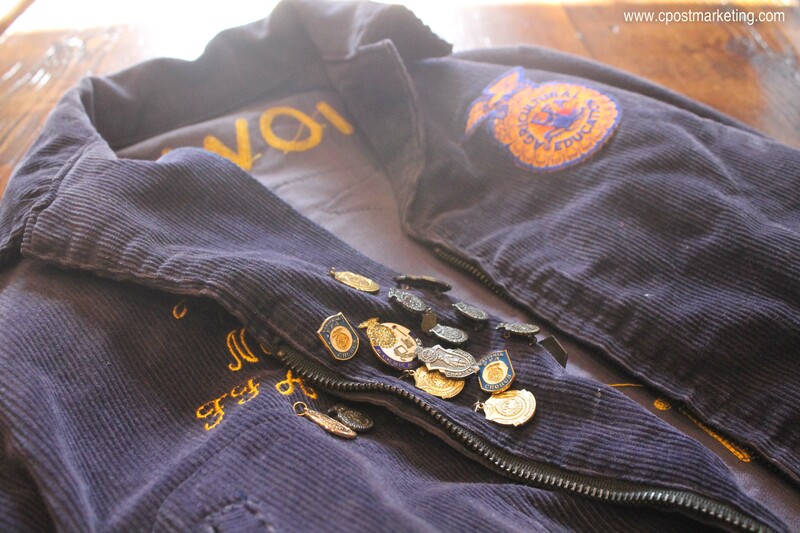 To anyone who has been a part of the organization and had the honor of wearing the official dress code with the FFA jacket, you more than likely have it stored in a closet somewhere, still adorned with timeworn award pins and souvenir buttons from National Conventions past. You may even take it out once in a while, shake off the dust, see if that zipper still works, or if you are like my family, rekindle stories of fond FFA memories. To those who see this article of clothing as only a blue, corduroy jacket that has somehow spanned decades of changing fashion trends, let me share with you what I see. You see a blue, corduroy jacket. I see growth. I see a timid, freshman student finding an organization that promotes them to grow their personal and career success without boundaries. I see an organization that was once thought of as only cows, sows and plows, and which has now grown to support agricultural innovation, technology, biological sciences and business. I see FFA members being recognized for growing their Supervised Agriculture Experience (SAE), taking part in hands-on work experience or building entrepreneurship initiatives into revenue generating businesses, which have collectively earned FFA members more than $4 billion annually. I see chapter advisors who go above and beyond the classroom to help each FFA member find their passion and succeed at reaching their goals, year after year. I see my first Reporter’s book, my first prepared public speaking contest, and my first officer interview, which all helped me grow into a career field I am deeply passionate about. You see a blue, corduroy jacket. I see leadership. I see chapter officer positions, from chapter level to national level, helping members gain leadership skills. I see thousands of programs and projects being led solely by FFA student members to benefit their communities, schools, agriculture and future careers. I see a group of FFA members from Lone Tree FFA in Iowa, who developed a plan to raise money for South Dakota ranchers affected by a devastating snowstorm. I see hundreds of famous and influential Americans who were once FFA members, including Former President, Jimmy Carter; legendary radio host, Orion Samuelson; NASCAR driver, Sterling Martin; Former North Carolina Governor, James B. Hunt; country music entertainer, Tim McGraw; and Pulitzer Prize winner, Nicholas Kristof. I see my own fellow FFA alumni who have become leaders in their professions and give credit to their time in that blue, corduroy jacket as a major contributor to their skills. You see a blue, corduroy jacket. I see opportunities. I see 25 Career Development Events (CDE’s) that challenge members with hands-on tests and real-life skills. I see the chance for students to experience agriculture, even as generations become further removed from the farm. I see chapters adding greenhouses, field test plots and clinics so students can learn by doing. I see awe-inspiring female FFA members, who now make up 47% of the membership after only officially being allowed into organization since 1969. I see awards that recognize the work members have placed in their SAE’s, leadership and futures. I see numerous scholarships and grants that help members follow their career paths. I see every pin on my jacket that represents the hard work and achievements I was able to reach through each opportunity the FFA organization provided me. You see a blue, corduroy jacket. I see camaraderie. I see over 600,000 members enrolled in FFA, making it the largest youth organization in the nation. I see every FFA chapter committee, social event, and chapter trip allowing FFA members to team build, reach goals together and celebrate in one another’s achievements. I see State and National FFA Conventions that bring student members from both rural and urban hometowns to one place where they learn and share experiences. I see first-year FFA members attending a Greenhand Fire-Up and experiencing for the first time the fellowship that FFA brings. I see students having the chance to meet with others who possess similar passions who would not otherwise have had the opportunity to connect. I see FFA alumni that continue to network with those they met through their FFA experiences long after wearing their jacket and who continue to give back to the organization through time, talents and dollars. I see my own fellow FFA alumni who I met through numerous events, both locally and nationally, that I have the fortune of still calling friends. You see a blue, corduroy jacket. I see the future of agriculture. I see members who will provide the food, fuel and fiber for our future growing population. I see all 50 states and 2 U.S. territories with chartered members, allowing agricultural education to reach the smallest rural town to the largest U.S. cities. I see the nation’s largest employer, agriculture, being filled by FFA members through hundreds of different careers. I see more than 3,000 sponsors and individual donors, giving to FFA and agricultural education programs. I see where my own future once began and which has allowed me to make my own positive impact in the agriculture industry. You see, it is not just a blue, corduroy jacket. It is a time-honored tradition that for 82 years has been a symbol of leadership, camaraderie, growth, opportunities, and a bright future for agriculture to those who still proudly let it hang in their closets. I see more than just a jacket. Learn more about the Iowa FFA Foundation and the National FFA Foundation and how you can help sustain this great organization. Next Is your website prepared for Google changes?